Now through March 31st only, receive free shipping on all the fire resistant and waterproof security chests below. These molded key locking safes are perfect for storing and protecting important documents and smaller valuables. Each of these unique safes is tested to withstand fire for a certain period of time (time depends on model of safe). They also have a waterproof seal to keep contents dry in case of flooding. Honeywell 1104 Molded Fire/Water Chest (.38 cu') Free Shipping For A Limited Time Only! Honeywell 1102 Molded Fire/Water Chest (.15 cu') Free Shipping For A Limited Time Only! Honeywell 1103 Molded Fire/Water Chest (.27 cu') Free Shipping For A Limited Time Only! 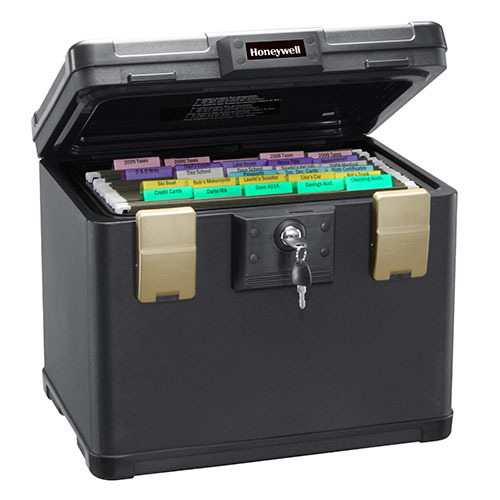 Honeywell 1106 Molded Fire/Water File Chest (.6 cu') Free Shipping For A Limited Time Only! 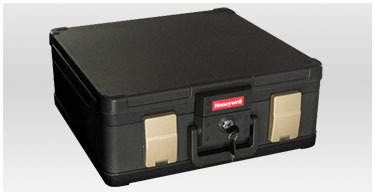 Honeywell 1101 Molded Fire Chest (.15 cu') Free Shipping For A Limited Time Only! Honeywell 1108 Molded Fire/Water Large File Chest (1.06 cu') Free Shipping For A Limited Time Only!